Mario Balotelli’s secret admiration for Ac Milan has been something widely known by many people as despite having his youth career and Inter Milan, the Italian international always hinted about his love affair with the Rossoneri. Now, after already starting his spell with Manchester City, the young striker once again hinted to the press that he could wear the red and black jersey in the near future after revealing his plan to play alongside Zlatan Ibrahimovic. “One day I would like to return to playing with Ibrahimovic, It doesn’t matter what shirt I wear. 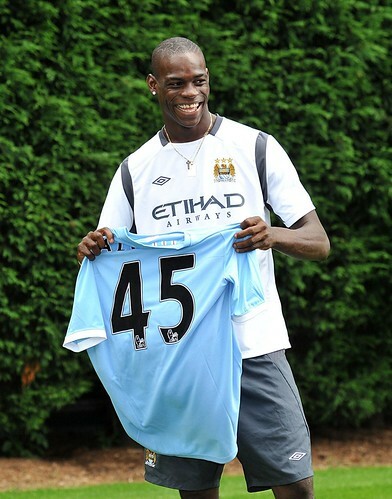 It would be great,” Balotelli said to La Gazzetta dello Sport. Considering the fact that Ibrahimovic’s current status is a loaned player at Milan, Balo’s words could also refer that the he is inviting Ibra to Manchester City, but that theory was squashed after the Swede recently pledged his future with the Rossoneri. With the 29-years-old latest statement, surely the scenario is pretty much heading into a future partnership between the two former Inter Milan players, especially since the Italian international has been spotted having a dinner with Ac Milan’s vice president, Adriano Galliani last weekend. Although the Italian media seems to predict that Balotelli will be a Milan player in the near future, it definitely won’t be an easy task as the striker is currently owned by a very rich club that doesn’t really need cash. However, considering the relationship between the Rossoneri and Balo’s agent, Mino Raiola, the impossible could very much turned into a possible stuffs although it probably would take some time to happen. Ibrahimovic and Balotelli actually have already enjoyed playing in the same club during their time at Inter Milan, however back then the two doesn’t actually play together a lot as Balo was still very young at the time. With his current step forward to maturity, it looks like that the 20-years-old striker is keen in finally playing alongside the Swede international in the near future.